What Do Business Professionals Think about Open Office Design? As business owners, we all have a lot to learn from one another. If you want to get your finger on the pulse of the small business community, check out the Succeed: Small Business Network on LinkedIn. This group of 80,000 business professionals offers a wide variety of perspectives on just about any topic you can imagine. For example, here’s a snapshot of their opinions on open office design. If a job involves sensitive information, an enclosed office is a necessity. Open plans work best for people who are in and out of the office—not those who are there the entire workday. Closed floor plans require workers to schedule time together, reducing interruptions during the regular workday and potentially increasing productivity during meetings. Phone work (from cold calling to conference calls) is difficult in an open office environment. An open office may help with creating a team environment for large projects. It seems to work well for strategists and creative professionals. High cubicles that are reconfigurable would make a reasonable substitute for private offices—especially if they could be equipped with doors. Open office works best when coworkers need to interact face-to-face frequently throughout the day. Working with too many people around is distracting. Having a few people work synergistically together in a small office is better than having a completely open room with no divisions. There’s one point of agreement: The best configuration depends on the type of work being done. Can You Make an Open Office Work? 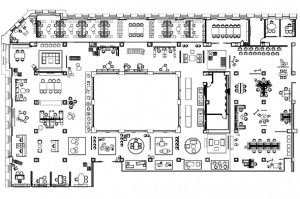 Open office layouts with no private offices and no cubicles can be very challenging. In the words of one management consultant: “An open environment is just an ad hoc meeting with no agenda or deadline peppered with interruptions, phone calls and extraneous noise.” If you must make do with an open office plan, here’s what it takes to help workers stay productive. Encourage respectful social interactions. Lack of privacy is a big problem. When people are in each other’s business all the time, it can be an HR nightmare. Put reasonable policies and guidelines in place along with a mechanism to enforce them fairly. If much of the work being done requires intense concentration, there need to be rules about “quiet time”. Or, give employees the freedom to seek out a quieter temporary workspace such as an empty office or conference room without fear of being reprimanded for not being at their desk. Educate workers about introversion. Open office layouts unfairly penalize workers who aren’t “social butterflies”, even though excessive socializing isn’t part of the job description and actually distracts from productive work. Help employees understand that some people simply need less chit-chat to feel like part of the team. If you’re really concerned about saving space, rethink why you want everyone in the office. Work that requires isolation might be done remotely. Consider letting some employees work from home or another location. A Swedish study published by the Institute of Ergonomics and Human Factors indicates that open plan offices really do make workers sick. The retrospective survey of over 1,850 people found that those in open offices fared worst. The study found “A significant excess risk for sickness absence was found in terms of short sick leave spells in the three open-plan offices.” In other words, workers were more likely to call in sick for a day or two when they were in an open plan setting. Men seemed particularly stressed by flex plan offices (hot desking with no assigned workstations). Women took more lengthy sick leaves if they had to work in large open offices. The researchers suggest that environmental stressors inherent in open plan offices may be partially to blame. They point to the example of, “architectural features that lead to a lack of visual and acoustic privacy in combination with the functional features that are related to job characteristics such as lack of autonomy.” Sometimes, employees may become so stressed that they simply need to take time off to decompress. Or, they may have less ability to isolate themselves from other workers. That means the cold or flu going around is going to spread with ease. The more people crammed into the space, the bigger this problem is likely to get. Interestingly, it’s apparently not sharing space that’s the issue. Employees in shared-room offices didn’t take a significantly different number of sick days compared to those in individual offices. Interestingly, one of the features the study used to define a shared office was this: Workstations are freely arranged in the room. For privacy reasons, sometimes screens or other divisional elements are added between workstations. Few businesses are likely to address noise and privacy issues by putting workers back in offices—shared or otherwise. Instead, the focus is on reducing distractions and giving employees more control over workstation configuration. Our desktop panels and cubicle wall extenders can do both since we provide a range of heights and colors in materials that minimize noise and increase visual privacy. The ongoing battle between determined open office adopters and cubicle dwellers continues. It’s not that workers don’t like the feel of open space, but the noise level is the most commonly cited problem with this kind of layout. To battle the constant din, many turn to panel extenders to protect their work bubble and also depend on the “evolving law of technology etiquette,” using isolating techniques such as headphones to defend against the onslaught of office sound. Background noise causes most of the dismay for office workers in an open environment. While some companies experiment with redesigning acoustics or piping in white noise to provide “sound masking”, scientists continue to measure productivity and happiness levels of workers in different environments. Researchers at the University of California, Berkeley, report that over 50% of office workers are unhappy with the level of “speech privacy,” in their workplace! The answer? For some, “pink noise” a soft whooshing emitted over loudspeakers that has been formulated to match the frequencies of human voices can help – in one study, the system was run for three months before being switched off – and the complaints on the day the system wasn’t operated reached epic proportions. For other, ditching the open office plan altogether and returning to a cubicle layout was the only ay to bring back a feeling of satisfaction and security for workers. Some companies experiment with larger cubicles that allow several co-workers to share space and collaborate, while others allow individual cubicle parameters, using panel extenders to shape each cubicle for the occupying worker’s comfort and convenience. Low cubicles can allow for an open feeling that isn’t quite as intrusive – with each worker depending on their configuration to create a space that allows for communication without distraction. While some may get useful ideas from overheard conversations, they also say it’s hard to have to retreat to a separate area for private chats or depend on email or chat messaging for privacy even when the party they want to speak with is right next to them. 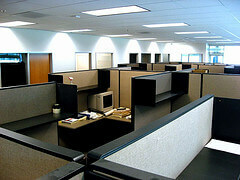 The open-plan design remains a big selling point for office designers because it is cheaper than cubicles and has been proven to work in certain verticals (such as newsrooms, trading floors and political campaign offices) but the “bullpen” is still not the top choice for those who need more quiet and privacy to remain productive. The cubicle is here to stay! A Cubicle for the Open Office? It’s always amusing to see the pendulum swinging back and forth between the champions of the open office and the proponents of the cubicle. We blogged about the “Me Place” workstation back in July of last year. But the latest publicity at OfficingToday.com gave us a chance to check out the video featuring an interview with the designers of this piece. They are very careful not to call their invention a cubicle. The article about the un-cubes describes them thus, “This particular workstation range features enclosed desks with walls”. Hmm. Sounds a lot like a cubicle. Basically, these tiny freestanding offices are a potential solution to the fact that the open office with no walls, no privacy, and too much noise simply doesn’t work for everyone all the time. The designers are calling this a new furniture typology. We think it’s a cozy and attractive design, but there’s an excellent article by Simon Keane-Cowell at Architon that demonstrates quite effectively that the idea of “semi-private, space-shaping furniture elements” has been around for a long time. The original forebears of the modern cubicle may simply have been introduced before the time was ripe for such ideas. According to Cowell, the reason the Action Office and other early designs were commercially unsuccessful may have been, “…that they were too progressive, that they weren’t so much responding to a shift in organizational behavior, but rather seeking to effect organizational-behavioral change through design.” Today’s open office plans could be accused of the same thing by attempting to force a collaborative atmosphere by how space is used. In any event, the current trend seems to be moving toward a balance of open and enclosed work areas. No doubt Docklands and other, similar products will be a part of this solution. However, these changes won’t be cheap. Keane-Cowell points out, “There’s a not insignificant financial investment required to populate your office with bays, pods and hubs.” Of course, he doesn’t know that we have a product that can turn a freestanding desk into a pod in less than five minutes. But you know! Contact us to order desk-mounted privacy panels today and get a quick and affordable retrofit for your open office. A search for ways to cut down on workplace distractions is what led to the creation of OBEX panel extender and desktop privacy panel products in the first place. So, it’s no wonder that we also like to keep abreast of all the other ways employees can learn to cope with noisy office interruptions. Here are a few great tips from around the web at places like ChatterBlocker, Office Smurf, and GIGAOM. Promote Good Etiquette: This is about more than not making calls from your cubicle on speaker phone. Make it a habit to take extended conversations into a conference room to avoid talking in group work areas. Encourage others to follow your example. Mask the Sounds: Products like ChatterBlocker, white noise machines, pink noise machines, music played through headphones, or simply the whirring of a fan can be a big help in drowning out unwanted noise. Practice Mindfulness and Meditation: Instead of having an annoyed response to the sounds that break your concentration, simply notice them and then get back to work. Spending less mental energy on anger means you can get back “in the zone” faster. Daily meditation can also train your mind to stay in the moment and be less distractible. Adjust Your Schedule: Work on tasks that require little concentration during the noisiest hours at the office. Or, make a pact with other office employees that the first hour of the day is “no talking” time. All over the blogosphere, office furniture writers recognize that an increasing number of employees are dissatisfied with the modern open office plan. This week, Arnold’s Office Furniture has a click-worthy blog post that offers advice for employers on how to provide workers with some much needed privacy. Some of the ideas are unexpected and quirky, so be sure to stop by and give the post a read. The top tip has to do with finding ways to cover up noise. Sound masking systems are mentioned as one solution. But there’s always the more old fashioned idea of putting up physical sound-absorbing barriers to cut unwanted noise. OBEX panel products have the advantage of offering two benefits for the price of one – workers get both sound-reduction and visual privacy. That’s something a pair of headphones or a white noise machine can’t provide. Of course, there’s no rule saying you can’t use both physical and technological solutions together for even greater impact!